Now Hiring Weight Loss Consultants! Contact us for information. Have this high protein tasty dinner as part of your diet meal plan. Pork has never tasted so good! Preheat oven to 450°F. Toast fennel seeds in a small dry skillet over medium heat, tossing often, until fragrant, about 4 minutes. Let cool. Combine fennel seeds, garlic, paprika, and 2 tablespoons oil in a small bowl. Season pork with salt and pepper and place in a resealable plastic bag. Add spice mixture; seal bag and turn to coat. Let sit at least 30 minutes. Heat remaining 1 tablespoon oil in a large ovenproof skillet, preferably cast iron, over medium-high heat. Cook pork chops until golden brown on 1 side, about 4 minutes; turn. Add potatoes and shallots to skillet; season with salt and pepper and toss to coat in pan drippings. Cook, tossing potatoes and shallots occasionally, until pork is golden brown on second side, about 4 minutes. Transfer to oven and roast until potatoes are tender and an instant-read thermometer inserted into thickest part of chops registers 135°F, 10–15 minutes. (If potatoes need more time, transfer chops to a plate and continue to roast potatoes until tender; transfer chops back to skillet when potatoes are done.) Remove skillet from oven and mix in parsley and vinegar. Let pork chops rest 5 minutes in skillet. Transfer chops to a cutting board; cut meat from bones and slice against the grain. Serve with potatoes, shallots, and any pan juices. 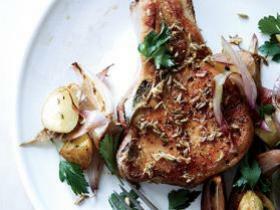 DO AHEAD: Pork chops can be marinated 1 day ahead. Keep chilled. DR. Blissenbach is the ONLY board certified Internal and Obesity medicine physician in Jacksonville, FL.